Natural gas is a combustible, gaseous mixture of simple hydrocarbon compounds that is usually found in deep underground reservoirs formed by porous rock. Natural gas is a fossil fuel composed almost entirely of methane although it does contain small amounts of other gases--ethane, propane, butane, and pentane. 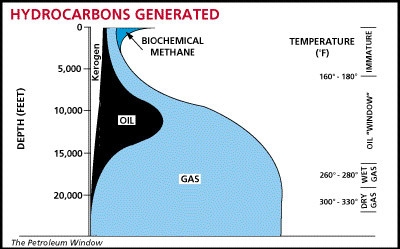 Methane is composed of a molecule of one carbon atom and four hydrogen atoms. Natural gas may be categorized by its composition. It can be a dry gas containing few liquid hydrocarbons. It can be a wet gas that's heavy in hydrocarbon liquids (sometimes containing water vapor). It can be a sour gas containing hydrogen sulphide. And it can be a sweet gas, which may have a trace of sulphur but no hydrogen sulphide. When the temperature of natural gas is reduced to -161 degrees Celsius and at atmospheric pressure, the gas changes from a vapour to a liquid. This shrinks the gas to less than 600 times its original volume. LNG is less than half as dense as water. It is colourless, odourless and non-toxic. It is stored as a liquid and later re gasified as needed. It has a flammability range of five to 15 percent. That means that any mixture containing less than five percent or greater than 15 percent natural gas to air would not support combustion. It has an absence of color, odor, and taste. Mercaptan is added to natural gas during distribution to give natural gas a distinct unpleasant odor. This acts as a safety device by allowing it to be detected in the atmosphere. It has a hydrocarbon molecular structure. That means that almost all components found in natural gas contain only the elements hydrogen and carbon. It's non toxic in nature. It burns with a blue flame when completely combusted which produces water and carbon dioxide. It has a boiling point of 259 degrees Fahrenheit (161.5 degrees Celsius). It has a heating value of 800 to 1200 BTUs per cubic foot. Natural gas occurs deep below the surface of the earth in three principal forms: associated gas, non-associated gas, and as a gas condensate. Associated gas is found in crude oil reservoirs, either dissolved in the crude oil, or in conjunction with crude oil deposits. It is produced from oil wells along with the crude. It separates, or is separated from, the oil at the casinghead of the well, which leads to the synonymous term "casinghead gas." It may also be called "oilwell gas" or "dissolved gas." 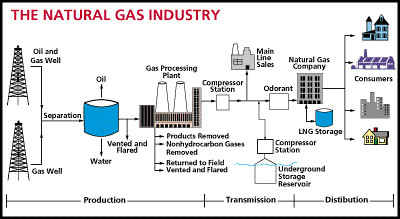 In the industry's beginning, virtually all processed gas was from oil wells. Non-associated gas occurs in reservoirs separate from crude oil. Its production is not incidental to the production of crude oil. It is commonly called "gas-well gas" or "dry gas." In addition, the reservoirs of many oil fields produce neither true gases nor true liquids. The material might properly be called a "two-phase fluid." It is neither a gas because of its high density, nor a liquid because no surface boundary exists between gas and liquid. These reservoirs, called "gas condensate" reservoirs, are usually deeper with higher pressures, which pose special problems in production, processing and recycling of the gas for maintenance of reservoir pressure. The search for gas begins by having geologists find an area of the country where gas and oil are most likely to be found. This involves the evaluation of the earth's history, and comparison with other areas where gas and oil are known to be present. Once such an area is designated for exploration, the geologist begins to conduct more specific tests to determine the likelihood that gas and oil are indeed present in the area. He or she may study above ground rock formations to determine the precise area where the folding of layers may have caused traps to form. Burning springs of natural gas were prominent in religious practices of ancient Persia and India, where temples were constructed around these "eternal flames." The Greeks, Persians, and Indians did not recognize the energy value or potential usefulness of natural gas. Ancient Chinese realized that natural gas could work for them. About 500 B.C., they used natural gas to make portable water by piping it from shallow wells through bamboo poles to evaporate salt from seawater. Britain commercialized the natural gas industry around 1785. This was gas manufactured from coal, not from naturally occurring natural gas. A Scotsman, William Murdock, improved upon a method of manufacturing natural gas and used it to light his home. Shortly afterwards, the first natural gas company illuminated London streets with gaslights. Manufactured natural gas arrived in the United States in 1816, when the city of Baltimore, Maryland installed gaslights. Baltimore's gas was also manufactured from coal. This gas had a much lower energy content and more impurities than today's natural gas. Other sources of natural gas were discovered, which were superior in performance and price. Early explorers noticed natural gas seeping up from the ground in the eastern United States and along the California coast. As early as 1626, French missionaries had recorded that Indians ignited gases in the shallows of Lake Erie and in streams flowing into the lake. The American natural gas industry began in this area, known as New York. The birthplace of underground natural gas in America is Fredonia, New York, a small village on the Candaway Creek near Lake Erie. In 1821, Fredonia residents observed gas bubbles rising to the surface from a creek. William Hart dug the first natural gas well in America along a creek outside Fredonia. The well was approximately 27 feet deep. (By contrast, today's wells are over 30,000 feet deep). As the first person to put natural gas to work in America, he is considered America's "father of natural gas." Other individuals expanded upon his work and a group of entrepreneurs formed the Fredonia Gas Light Company, our nation's first natural gas company. Natural gas continued to aggressively compete with manufactured gas into the 1920's. Plants that manufactured gas from coal were usually located in prominent cities, where there was a large and steady demand. During this time manufactured gas had a competitive advantage over coal's established distribution system. In the 1950's, interstate pipelines reached across the entire continent to provide competitive, naturally occurring natural gas, and manufactured gas' dominance declined. America's interstate pipeline system now contains over one million miles of pipe that deliver large quantities of clean, efficient and cost-effective natural gas to different regions. WHERE DOES NATURAL GAS COMES FROM ? Scientific theory has it that natural gas was formed millions of years ago when plants and tiny sea animals were buried by sand and rock. Layers of mud, sand, rock, plant, and animal matter continued to build up until the pressure and heat from the earth turned them into a tar-like substance called kerogen. As temperatures continued to increase and the kerogen continued "cooking," more complex compounds of carbon and hydrogen known as oil were formed. Natural gas was generated at the same time as oil. However, peak generation occurs when oil begins to break down because of high geothermal temperatures (greater than 400 degrees Fahrenheit). As natural gas molecules form, they migrate from the shale "source rock" into more porous areas such as sandstone. They continue moving to either the earth's surface where they escape into the atmosphere or are trapped when their path is blocked by nonporous rock. 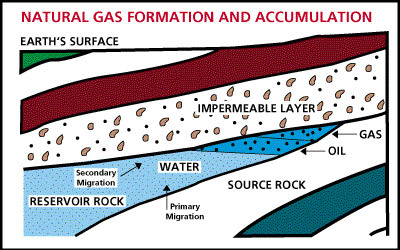 In the latter case, the impermeable rock layers cause natural gas accumulation to occur. Gas processing industry gathers, conditions and refines raw natural gas from the earth into saleable, useful energy forms for use in a wide variety of applications. The removal and separation of individual hydrocarbons by processing is possible because of the differences in physical properties. Each component has a distinctive weight, boiling point, vapor pressure and other physical characteristics, making its separation from other components a relatively simple physical operation. Therefore, all natural gas is processed in some manner to remove unwanted water vapor, solids and/or other contaminants that would interfere with pipeline transportation or marketing of the gas. In addition, and equally important, most natural gas is processed to separate from the gas those hydrocarbon liquids that have higher value as separate products. After raw gas from the wellhead is processed, it is moved into a pipeline system for transportation to an area where it will be sold. A pipeline company is a totally separate company from a producer or a distributor, although sometimes pipelines sell gas directly to large customers. The interstate pipeline system has to be reliable, efficient and the transportation costs make up a large portion of the consumer's price for natural gas. Most sections of pipeline are made of steel piping, measuring anywhere from 20 to 42 inches in diameter. When natural gas is moved through a pipeline, it is transmitted at higher pressures to reduce the volume of the gas, and provide a pushing force to propel the gas through the pipe. In order to maintain the level of pressure required to move the large volumes of gas through a pipeline, the gas needs to be compressed periodically as it moves through the pipeline. This requires pipelines to install compressor stations along the pipeline. Most of these compressors are classified as reciprocating compressors, which means that they are powered by a very small portion of the natural gas that flows through the pipeline. These compressors are efficient and safe, their only drawback being that they tend to be quite large. One of the classic environmental problems with any sort of energy is that a portion of the energy is lost in transporting it from its source to its destination. Gas transportation is very efficient in this respect, compared to other energy resources. Only about 3 percent of the gas energy that is transported is lost in the process. When considering the efficiency of an energy resource from start to finish, gas appears even more efficient. These pipelines need to be monitored 24 hours a day and 365 days a year. In order to keep accurate, constant information on sections of pipeline, pipeline companies use 'supervisory control and data acquisition systems' (SCADA). These are computerized systems that allow pipeline operators to acquire information from remote sections of pipeline, and also control the flow of gas at remote locations by using computers that are linked to satellite communication and telephone communication systems. SCADA systems allow not only the pipeline operators to obtain timely information, but they also allow producers to have access to some of the same information so that they can purchase distribution services according to the current volume of gas in a pipeline. The information that is provided to those shipping gas on pipelines is posted on electronic bulletin boards (EBBs), which can be accessed by users in order to purchase transportation service, check on billing, or arrange storage of gas that has been transported through a pipeline. Another method that pipeline companies use to maintain their pipelines is the use of intelligent PIGs (intelligent robotic inspection devices). Not like your typical farm animal, these PIGs are used to inspect pipeline interior walls for corrosion and defects, measure the interior diameter of a section of pipe, and to remove accumulated debris from a section of pipeline. As a PIG travels through a pipeline, it takes thousands of measurements with its accurate sensors that can later be analysed and modelled by computers for a pipeline to show possible problems. Although pipelines use cathodic protection for many newer sections of their pipelines, they still encounter corrosion problems that weaken some parts of the pipeline. Magnetic-flux leakage PIGs are used to detect metal loss in pipeline walls, locating potential problems without the cost and risk of using other methods. Investor-owned, which are owned by shareholders. Municipally owned (sometimes called public gas systems), which are owned by local governments, such as cities, countries and special utility districts. For most of the 20th century, LDCs have been awarded exclusive rights (or franchises) to distribute gas in a specified geographic areas. In return, investor-owned LDCs are regulated by state public utility commissions to assure adequate gas supply, dependable service, and reasonable prices for consumers, and to assure reasonable rates of return on investment for the shareholders. Municipally operated LDCs are owned by the local community and governed by agencies of local government to assure compliance with local needs and preferences. While many large gas users today buy gas from marketers, LDCs continue to serve residential, commercial, and industrial customers. Usually, LDCs have different rates for different customer classifications based considerations such as the amount of gas used or daily and seasonal fluctuations in use. Buy gas directly from producers, pipelines, marketers and other LDCs. Contract separately for storage and other services. Team with others to get volume discounts. Many LDCs now offer "transmission-only"service under which customers may make arrangements to buy and transport the gas to their site, using the LDC's distribution lines for the last leg of the journey. Today, it is primarily larger users who purchase gas separately from transmission services; smaller users still tend toward the "bundled" gas product-and-service offered by most LDCs. In the future, however, residential and commercial end users may be offered new ways to buy natural gas. A number of states are experimenting with pilot programs permitting smaller users, including residences, to buy gas from a party other than the local LDC. Computer mapping systems that help locate underground pipe. New trenching techniques that reduce excavation and site restoration costs when mains are extended or when pipes are replaced or repaired. Some of these techniques involve guided boring systems that can install pipe without extensive disturbance of land surfaces. In addition, like interstate pipelines, distributors make extensive use of computer-based transportation technologies such as valve regulation via satellite telemetry and "supervisory control and data acquisition" (SCADA) systems that control gas flow while also providing accounting information, contract data, and electronic gas measurement. When natural gas reaches its destination from a pipeline, it is often stored prior to distribution. It acts as a sort of buffer between the pipeline and the distribution system. Storage allows distribution companies to serve their customers more reliably by withdrawing more gas from storage to meet customer demands during peak use periods. It also allows the sale of fixed quantities of natural gas on the spot market during off-peak periods. Having local storage of gas also reduces the time necessary for a delivery system to respond to increased gas demand. Storage also allows continuous service, even when production or pipeline transportation services are interrupted. Underground storage, in common usage, is gas transferred from the reservoir of discovery to other reservoirs, usually closer to market areas, where it is stored until needed to meet market demand. Natural gas is stored in underground reservoirs primarily to ensure the capability of the gas industry to meet seasonal fluctuations in demand. Underground storage supplements the industry's production and delivery systems, allowing supply reliability during periods of heavy gas demand by residential and commercial consumers for space heating. Storage is also used occasionally as a conservation measure to prevent flaring and other waste when production rates exceed marketability. The most important characteristic of an underground storage reservoir is its capability to hold natural gas for future delivery. The measure of this is called working gas capacity: the amount of natural gas inventory that can be withdrawn to serve customer needs. In addition to working (top storage) gas, underground storage reservoirs also contain base (cushion) gas and, in the case of depleted oil and/or gas field reservoirs, native gas. Native gas is the gas that remains after economic production ceases and before conversion to use as a storage site. Upon development of a storage site, additional gas is injected and combined with any existing native gas in order to develop and maintain adequate storage reservoir pressure to meet required service. The resulting (permanent) inventory is referred to as the base or cushion load. During heavy demand periods, some base gas may be withdrawn temporarily and delivered as working gas, but over the long term, base levels must be maintained to ensure operational capability. Natural aquifers have been converted to gas storage reservoirs. An aquifer is suitable for gas storage if the water-bearing sedimentary rock formation is overlaid with an impermeable cap rock. While the geology of aquifers is similar to depleted production fields, their use in gas storage usually requires base (cushion) gas and greater monitoring of withdrawal and injection performance. Deliverability rates may be enhanced by the presence of an active water drive. Salt caverns, the third main type of storage, provide very high withdrawal and injection rates compared with their working gas capacity. Base gas requirements are relatively low. The large majority of salt cavern storage facilities have been developed in salt dome formations to take advantage of the high volume and flexible operations possible with a cavern facility. Cavern construction is more costly than depleted field conversions when measured on the basis of dollars per thousand cubic feet of working gas, but the ability to perform several withdrawal and injection cycles each year reduces the per-unit cost of each thousand cubic feet of gas injected and withdrawn.